What is the role, if any,of advanced primary care models like the PCMH in the success or failure of ACOs? In the first-ever study of its kind, the Patient-Centered Primary Care Collaborative’s (PCPCC) 2018 Evidence Report examines the interaction between the Patient-Centered Medical Homes (PCMHs) and the Accountable Care Organization (ACOs) through both qualitative and quantitative methods, with the aim of answering the question above. 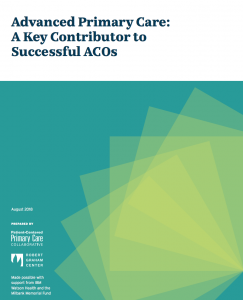 Notably, the characteristics that lead to the success of ACOs are also central to the success of advanced primary care models such as the PCMH. The literature suggested that ACOs with a central focus on, or with leadership from, advanced primary care teams experienced positive results in terms of cost, quality, and utilization.